Yamaha released some impressive AV receivers to go along with many of their other fine AVRs. The Yamaha RX-V581 has a very good set of features highlighted by DTS:X, Dolby Atmos and MusicCast. It’s also fairly future proof with its support for the 4k video. All of this plus it has solid sound quality. 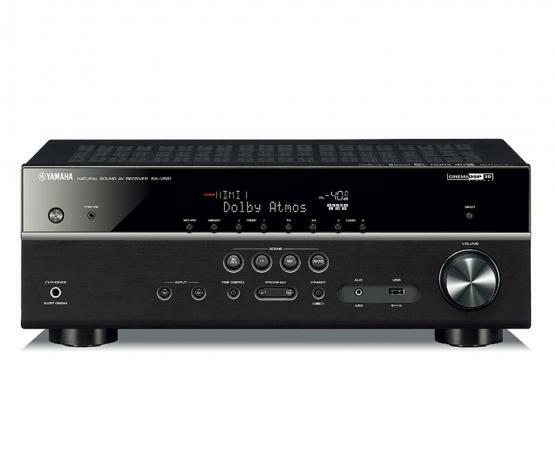 With the RX-V581 and only $100 more than the RX-V481 av receiver, one can start to delve into many of the features offered from Yamaha. This 80w 7.2 channel AVR with 5-way binding posts offers DTS:X and Dolby Atmos decoding. The subwoofer trim technology that Yamaha incorporates in their modern receivers, probably more effective when used with two subwoofers rather than one to further enhance the sound imaging and smoothing which two subwoofers can provide. This is also beneficial for those with basically ‘plug n play’ subwoofers that don’t have any bass management features on the amplifier section. MusicCast is also available with this receiver as it’s available with all the receivers in this series. With the connections on the rear of this receiver, one can use a single rear ‘back’ speaker for the 6.2 playback, two speakers for true 7.2 playback, Zone B connection for two speakers in another room, and the front ‘height’ speakers, or one can choose to Bi-Amp the front channel speakers if speakers allow for this connection. This receiver also features Yamaha’s Virtual Presence and Virtual Surround Back speaker tech which allows one to use the system to reproduce the effect of ‘Height’ speakers and surround ‘back’ speakers when there is no actual speakers present. This is possible only when the CINEMA DSP 3D function is chosen. It’s a nice feature for those who are not able to install rear ‘back’ speakers or ‘height’ speakers.